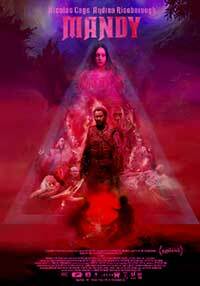 Mandy is the new film from visionary writer-director Panos Cosmatos who brought the science fiction enigma that was Beyond the Black Rainbow a few years ago. That film showcased what a surrealist filmmaker he was and showed great promise on what he could achieve with a minimal cast and even more minimal budget. Red Miller (Nicolas Cage) lives in seclusion with his beautiful and artistic girlfriend, Mandy (Andrea Riseborough), in relative seclusion in the beautiful wilderness. He’s a lumberjack by day and she is an artist by day and night. She spends her times creating beautiful pieces of art while spinning vinyl. They are a happy and simple couple living their lives the way they’ve always wanted. On one fateful night while out for a walk, Mandy is observed by the leader of a crazy religious sect and is kidnapped and brought to him. Jeremiah Sand (Linus Roache) leads a band of troubled and delusional followers through the wilderness in search of their next targets. They practice unholy mass and incantations and slaughter animals to sacrifice in these rituals. Mandy has become a pawn in an unholy plot by the cult. Red has to come in and save Mandy and exact great vengeance on every one of the cult members, which will lead to a showdown with the leader himself. As you can see, I’m trying to keep simple and linear…and coherent. I’ve personally never done drugs or have ever been under any sort of hallucinogenic whatsoever, but when I watched Mandy after many months of hype and anticipation – I felt like I was under a great influence. The film, unfortunately, did not play in theaters near me, so I had to get the Digital HD version for this review. 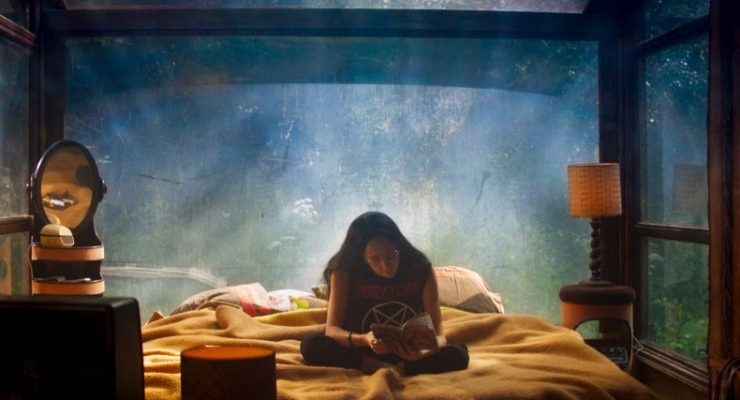 Andrea Riseborough as Mandy in the action, thriller film “MANDY” an RLJE Films release. Photo courtesy of RLJE Films. Every frame of Mandy drips with style and a surrealism not seen in cinema in quite some time. The main story is relatively easy to follow but writer-director Panos Cosmatos has injected poetry and metaphor into the blood-life of the film. There’s an almost “Jodorowsky-ian” feel to Mandy. As far as more modern influences go – I get Highlander and Evil Dead/Army of Darkness vibes. Nicolas Cage gets to go insane and it works under the context he is in and been put through. The violence is ultra-heavy, as well. A couple of days ago I found out that the great fantasy, Julie Bell, had created most of the artwork and paintings featured in the film. Bell is one of my favorite fantasy artists along with her husband Boris Vallejo. That was a treat. Currently, Mandy is playing in very limited release across the United States, but is available on most Digital HD and VOD platforms. I purchased my copy via iTunes and that version also has a 23-minute documentary on the making of the film and 13-minutes of deleted and extended scenes. Not bad for a digital copy. The official Blu-ray is released next month around Halloween but there is no word on extras or a 4K release. Go in with an open mind absorb as much as you can. Mandy is one of the best films of the year. In 1983, Red Miller (Nicolas Cage) seeks bloody revenge on the cult that killed the love of his life in the visceral horror filmMandy, a sublime work of film art. 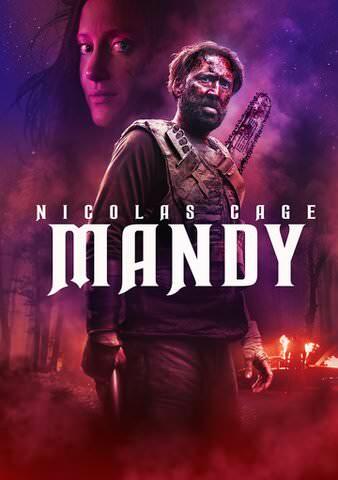 Mandy is one of the best films of the year and will hopefully re-catapult Nicolas Cage back into our good graces. It goes to show you that all he needs is to be challenged with great material and he can do great things with it. I look forward to Panos Cosmatos' next film and hope it doesn't take 5-6 years to get it made.